I measured the Elegias using a G.R.A.S. Model 43AG ear/cheek simulator/RA0402 ear simulator, a Clio 10 FW audio analyzer, a laptop computer running TrueRTA software with an M-Audio MobilePre USB audio interface, and a Musical Fidelity V-CAN amp, with an Audio-gd NFB-1AMP used for distortion measurements. 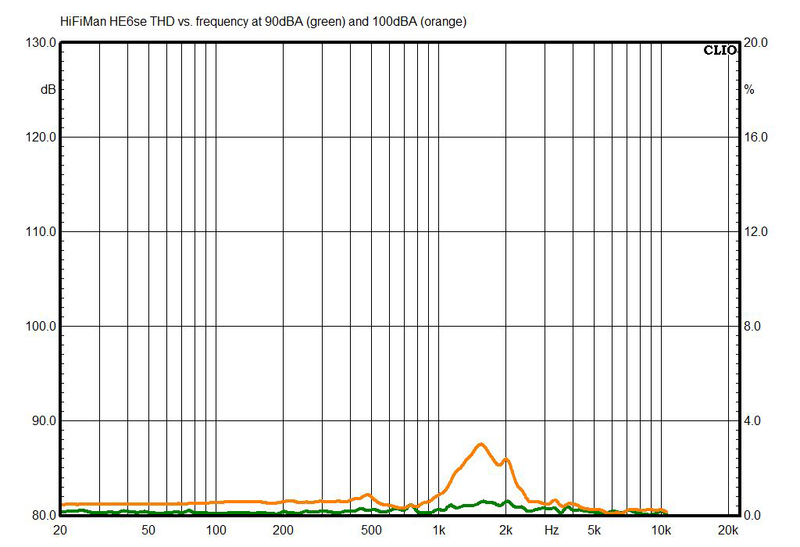 On the Model 43AG, I used the new KB5000 anthropomorphic simulated pinna for most measurements, and the original KB0065 pinna for certain other measurements, as noted. These are “flat” measurements; no diffuse-field or free-field compensation curve was employed. 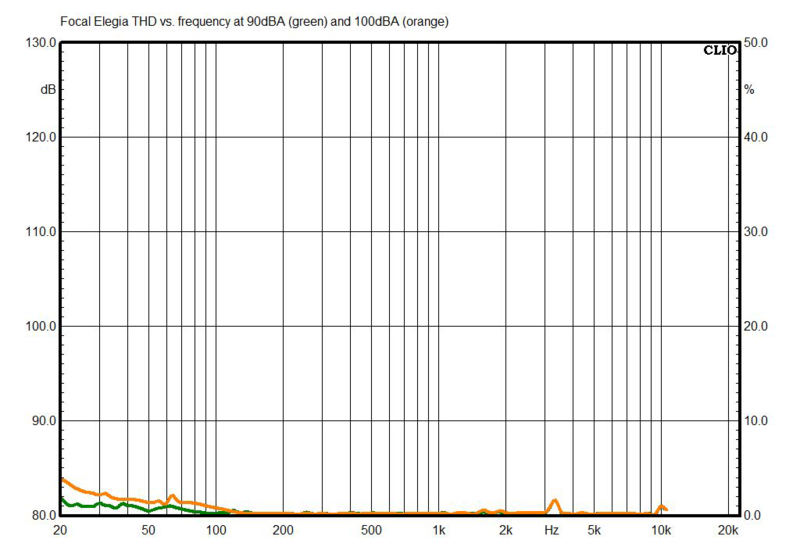 The above chart shows the Elegias’ frequency response measured with the new KB5000 and KB5001 anthropomorphic simulated pinnae. This is the best match I was able to achieve between the left and right channels. They match very closely in the midrange, where it counts most. There is a pretty big difference in the bass, which I have to suspect may be due to the way the earpads seal on the face of the ear/cheek simulator (which has to be turned 180 degrees when doing left-ear measurements), but the bass response you see here was very consistent as I moved the headphones around on the simulator, and I usually get a better match than this. Caveats aside, this is an unusual measurement in that the peak in the 3kHz region (which is generally considered to make headphones sound more like speakers in a room) is very mild, only about 4dB above the response at 500Hz; often, the peak is more like 12dB above the 500Hz response. 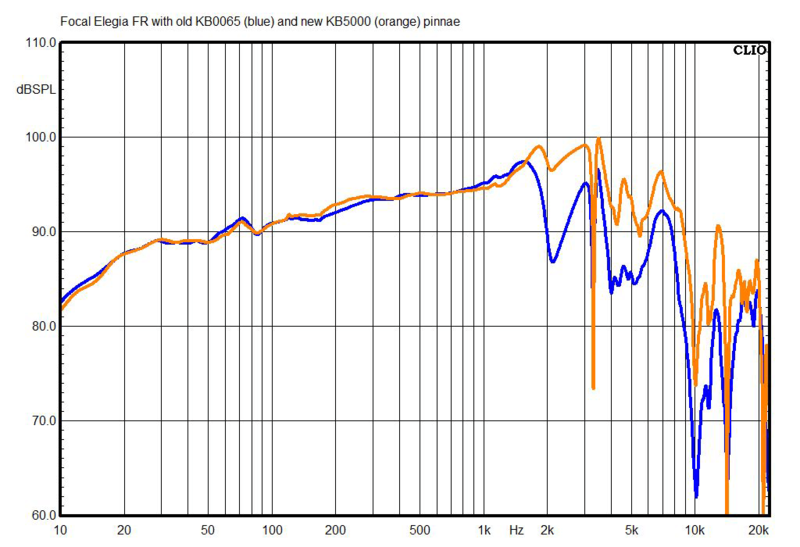 This chart shows the Elegias’ right-channel frequency response measured with the old KB0065 pinna (which I’ve used for years) and G.R.A.S.’s new KB5000 pinna, which I recently switched to because it more accurately reflects the structure and pliability of the human ear. This is just for sake of comparison with older measurements of mine. Here you can see how the Elegias’ tonal balance changes when they’re used with a high-impedance source, such as a cheap laptop or some cheap professional headphone amps. It’s a significant effect; the higher-impedance source produces a broad boost that maxes out at 2.6dB at 90Hz, enough to audibly tilt the tonal balance (and in a way I think would likely be to most people’s taste). 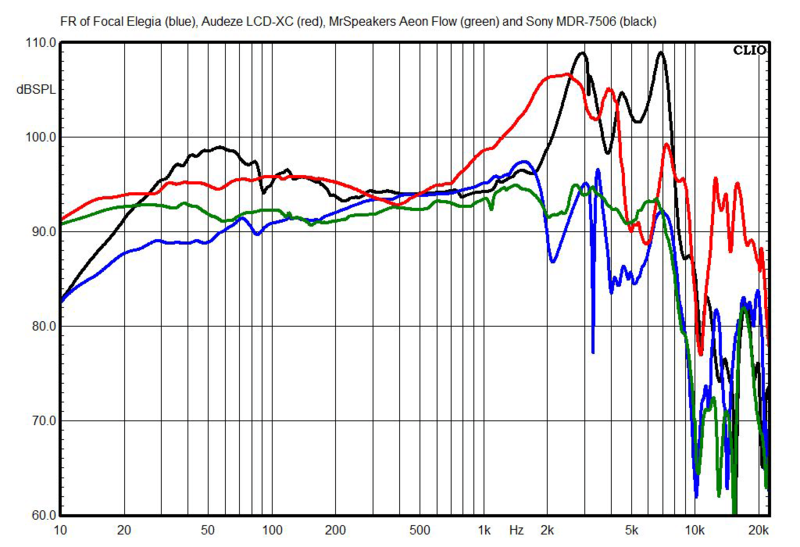 This chart shows the Elegias’ right-channel response compared with two other high-end closed-back headphones (the Audeze LCD-XCs and the MrSpeakers Æon Flows with their two-hole white filter installed), as well as the Sony MDR-7506es, a standard fixture in audio production work that generally conform to the “Harman curve,” shown in research by Harman International to be the preferred over-ear headphone response for most listeners. These measurements use the older KB0065 pinna, because that’s the only measurement I have for the LCD-XCs. You can see how unusually flat the Elegias’ response is here. 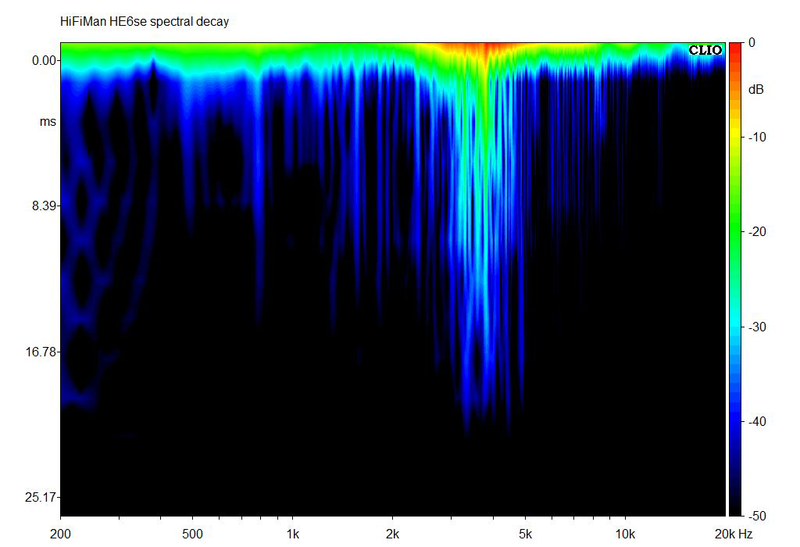 The Elegias’ spectral decay (waterfall) chart shows a fairly strong resonance at 3.2kHz, which doesn’t seem to correspond to any particular feature of the frequency response. It’s well-damped, though, and nearly gone after about 5ms. 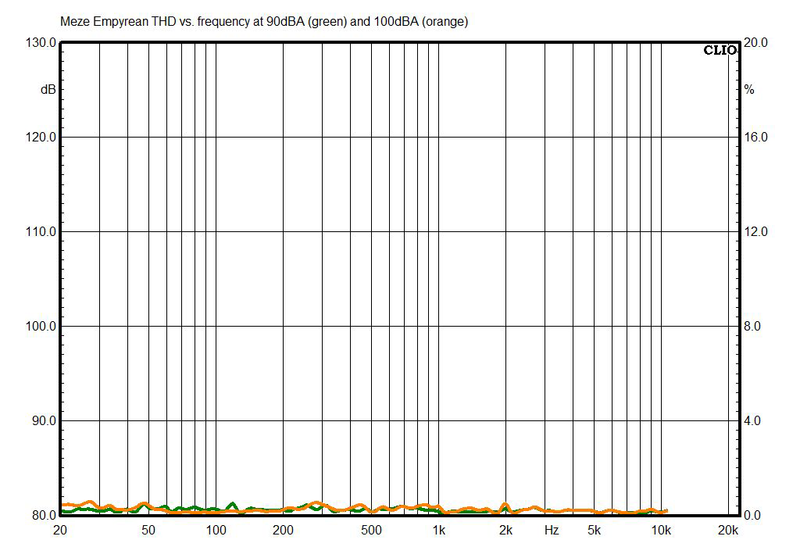 Measured total harmonic distortion (THD) of the Elegias is almost non-existent above 150Hz, and barely breaches 2% in the bass even at the extremely loud level of 100dBA. In this chart, the external noise level is 85dB SPL, and numbers below that indicate the degree of attenuation of outside sounds. The Elegias’ isolation is very good for a passive closed-back model, generally beating the MrSpeakers Æon Flows and easily beating the smaller NAD Viso HP50s. 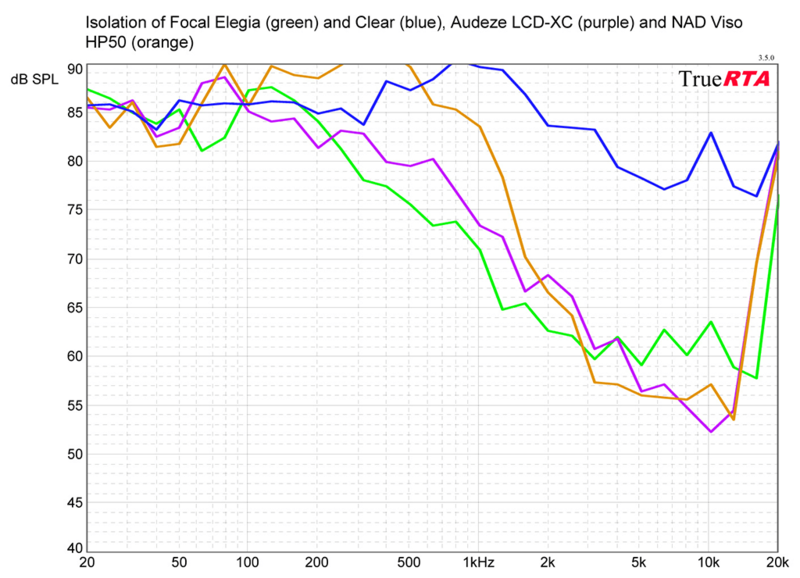 I threw in the Focal Clear isolation measurement to show the advantage in isolation gained by the closed-back design of the Elegias. 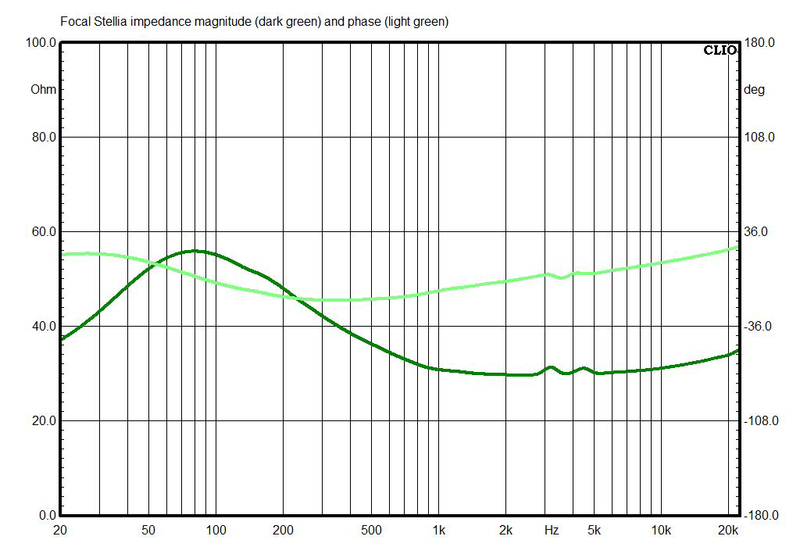 The Elegias’ impedance response is typical for closed-back, dynamic-driver headphones, with the impedance generally hovering close to the rated 35 ohms and rising to 57 ohms peak at the 70Hz system resonance. 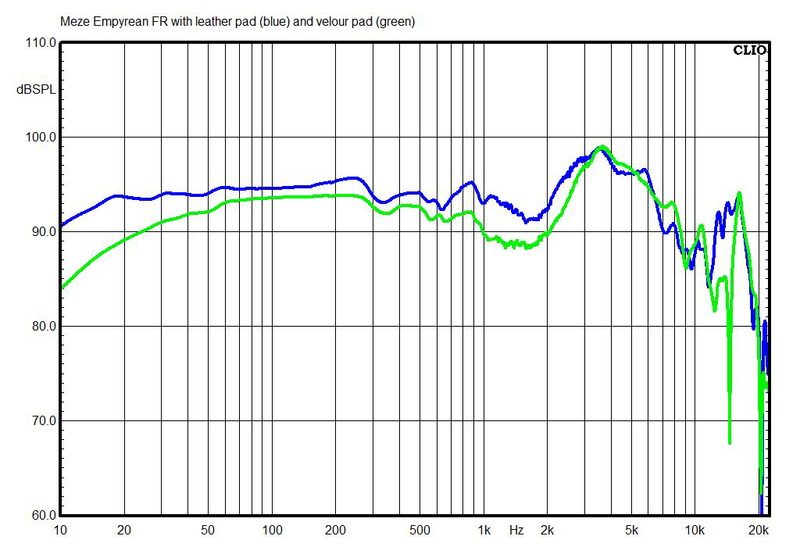 The phase response is fairly flat for large dynamic-driver headphones. The sensitivity of the Elegias, measured between 300Hz and 3kHz with the leatherette pads using a 1mW signal calculated for 35 ohms impedance, is 102.9dB. That’s quite high for audiophile-oriented headphones, and it should be enough to get loud volumes from almost any source device. I measured the AH-D7200s using laboratory-grade equipment: a G.R.A.S. Model 43AG ear/cheek simulator/RA0402 ear simulator with KB5000/KB5001 simulated pinnae, and a Clio 10 FW audio analyzer. For isolation measurements, I used a laptop computer running TrueRTA software with an M-Audio MobilePre USB audio interface. The headphones were powered using a Musical Fidelity V-CAN and an Audio-gd NFB-1AMP. These are “flat” measurements; no diffuse-field or free-field compensation curve was employed. If you’d like to learn more about what our measurements mean, click here. 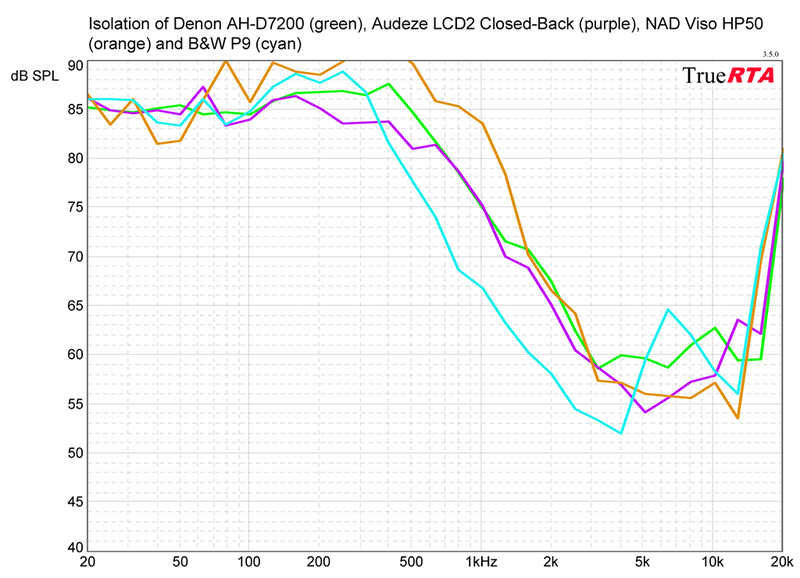 The above chart shows the AH-D7200s’ frequency response. 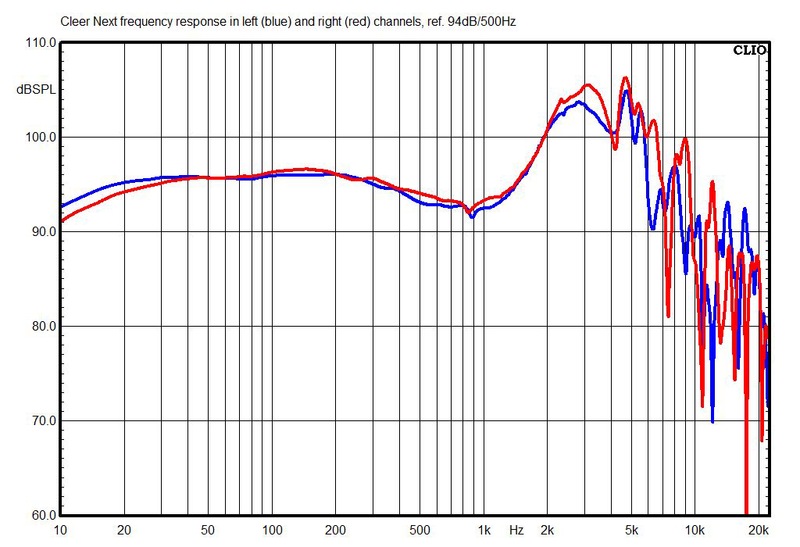 This is unusual in that there’s little or none of the usual peak centered near 3kHz that we see in almost all headphones. This peak is generally considered necessary to create a reasonable simulation of hearing real speakers in a room. Without such a peak, headphones are unlikely to create a natural sense of space, and are likely to sound dull. Note that these measurements are the ones that were most typical (i.e., roughly average) of numerous measurements taken of each channel with the earcups in slightly different positions on the ear/cheek simulator. In the right channel, I was occasionally able to measure a mild peak of a few dB in the 3kHz range, but in most measurements it didn’t show up. I never got it to appear in the left-channel measurements no matter how I positioned the earcups. 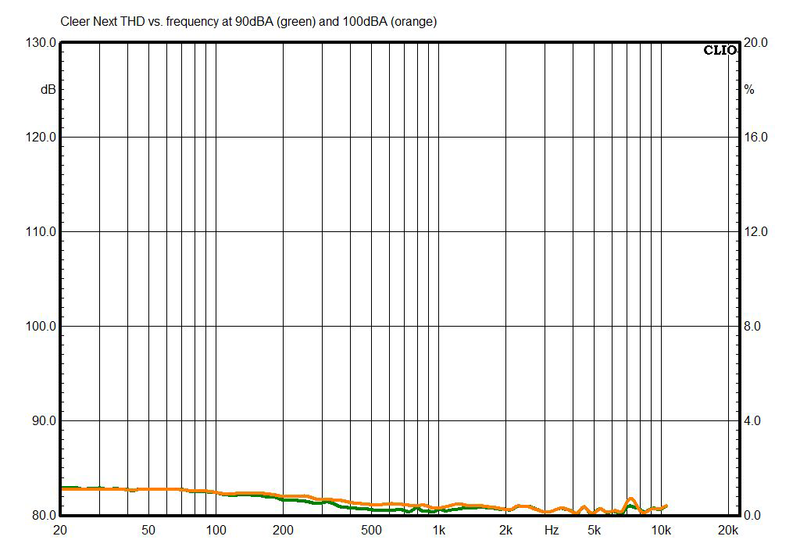 This chart shows how the AH-D7200s’ tonal balance changes when they’re used with a high-impedance (75 ohms) source, such as a cheap laptop or some cheap professional headphone amps. 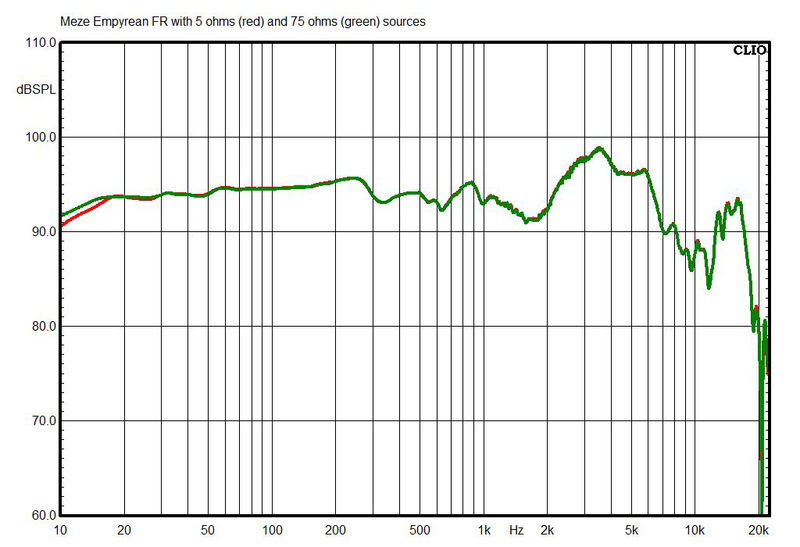 Using the higher-impedance source produces a slight extra kick in the bass -- a boost of about 1dB centered at 30Hz. 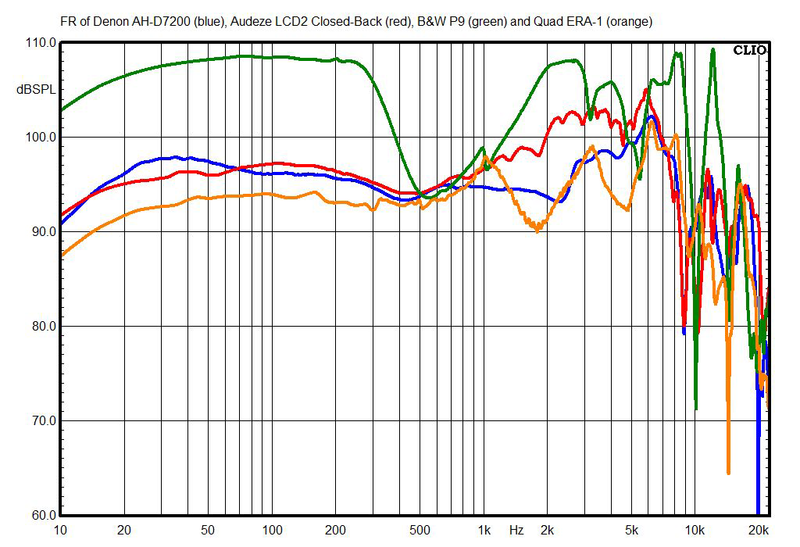 This chart shows the AH-D7200s’ right-channel response compared with two other high-end closed-back headphones (Audeze LCD2 Closed-Backs and Bowers & Wilkins P9s) and the Quad ERA-1s, which I consider a semi-open-back (or semi-closed-back, if you prefer) design. 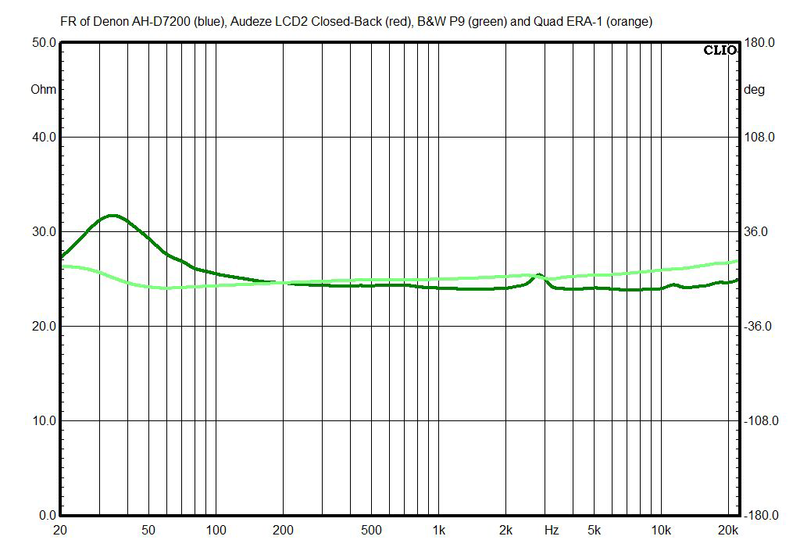 While the AH-D7200s are similar in many ways to the Audeze LCD2 Closed-Backs, they have 4 to 8dB less energy between 1.3 and 4kHz. 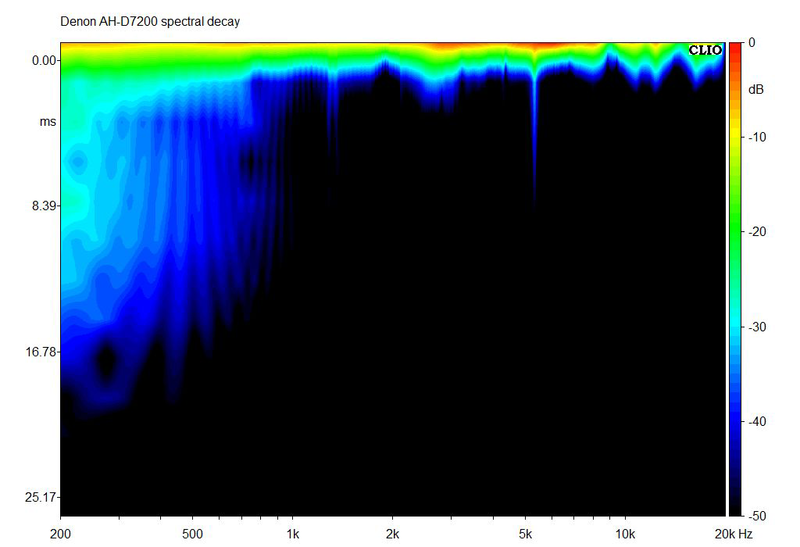 The AH-D7200s’ spectral decay (waterfall) chart shows practically no resonance at all across the entire audioband. There’s one resonance at 5kHz, but considering that it’s extremely narrow, and that it’s down to -40dB within about 2ms, it’s highly unlikely to be audible. 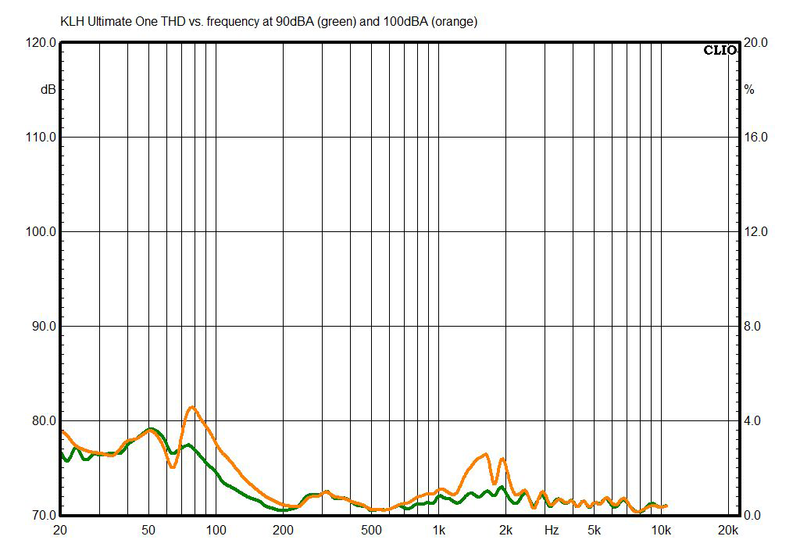 The AH-D7200s’ measured total harmonic distortion (THD) is near zero above 100Hz at the loud listening level of 90dBA, rising to just 3% at 20Hz. Predictably, there’s more at the crazy-loud level of 100dBA -- 2% at 100Hz, rising to 4% at 50Hz and 8% at 20Hz -- but because the distortion is limited to the bass, the distortion harmonics will be low in pitch and probably won’t be troublesome, especially considering that your ears will be begging for mercy at that listening level, anyway. In this chart, the external noise level is 85dB SPL, and numbers below that indicate the degree of attenuation of outside sounds. 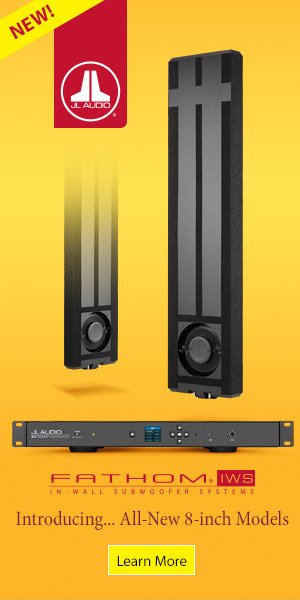 Isolation of the AH-D7200s is comparable to that of the other closed-back models shown, and adequate to block most office chatter and light background music. 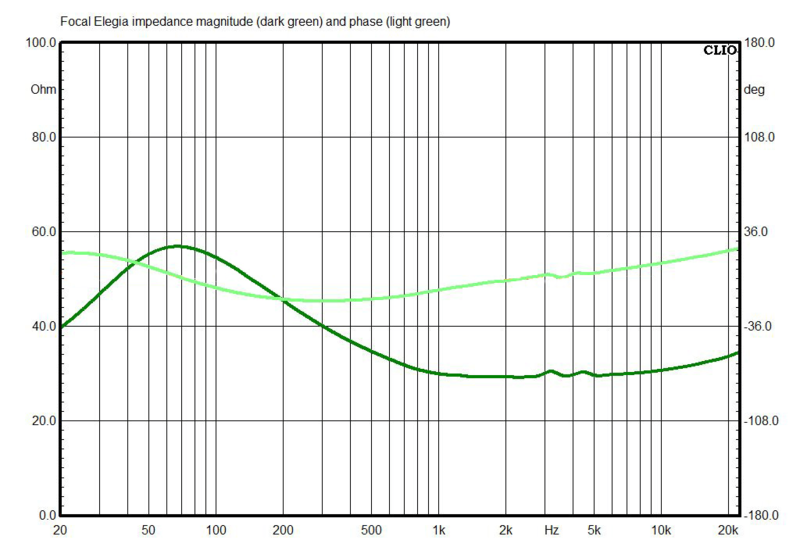 The impedance magnitude of the AH-D7200s is mostly flat at or near the rated 25 ohms, with a small rise to 32 ohms centered at 34Hz. That little rise is why the bass response varies with different source impedances. The impedance phase is very close to flat. 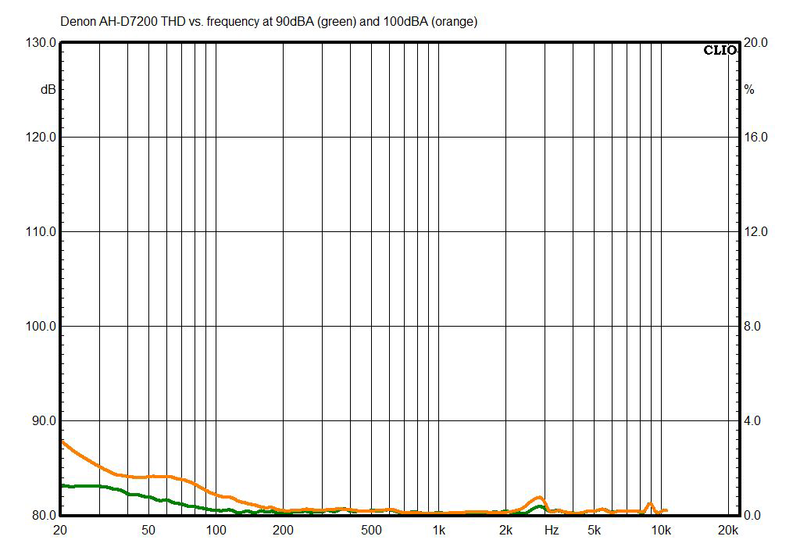 Sensitivity of the AH-D7200s, measured between 300Hz and 3kHz, using a 1mW signal calculated for 25 ohms rated impedance, is 99.7dB. That’s about 5dB below the rated sensitivity, but still sensitive enough that you can get plenty of volume when plugging the AH-D7200s straight into a smartphone or tablet. 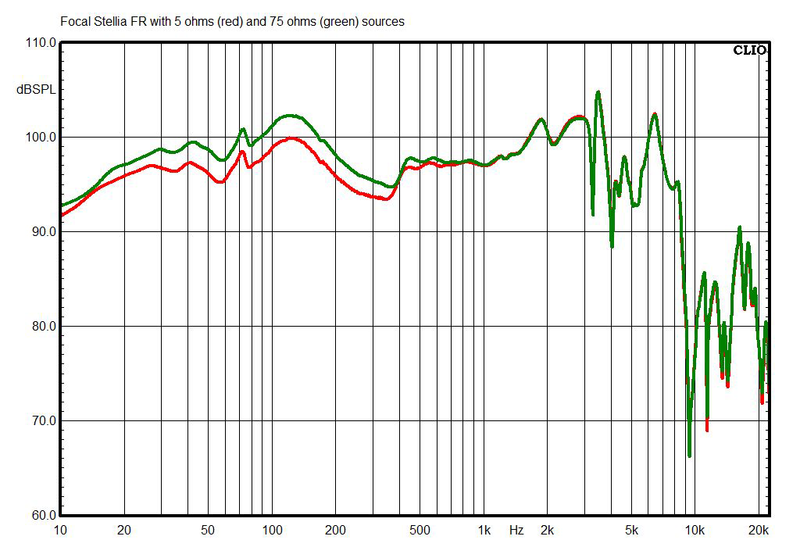 I measured the Next headphones using laboratory-grade equipment: a G.R.A.S. Model 43AG ear/cheek simulator/RA0402 ear simulator with KB5000/KB5001 simulated pinnae, and a Clio 10 FW audio analyzer. For isolation measurements, I used a laptop computer running TrueRTA software with an M-Audio MobilePre USB audio interface. The headphones were amplified using a Musical Fidelity V-CAN and an Audio-gd NFB-1AMP. These are “flat” measurements; no diffuse-field or free-field compensation curve was employed. The above chart shows the Nexts’ frequency response. Surprisingly, considering our listeners’ reactions, this response is within the range of normal for headphones, but we can see two idiosyncrasies that correspond with our subjective impressions. 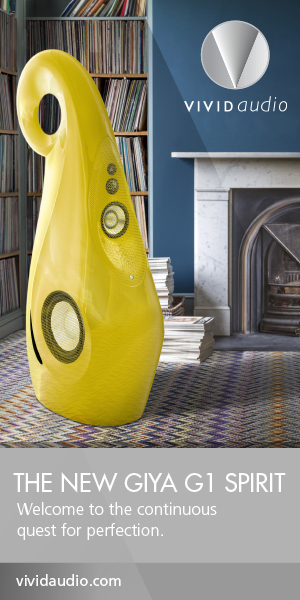 There’s a shallow but unusually broad bass boost -- it spans about five octaves, while dynamic headphones might typically show a stronger but much narrower boost about two-and-a-half octaves wide. Also, the peak at 5.7kHz is a little stronger than the 3kHz peak. I’d normally expect that peak to be about 3 to 6dB weaker than the 3kHz peak. 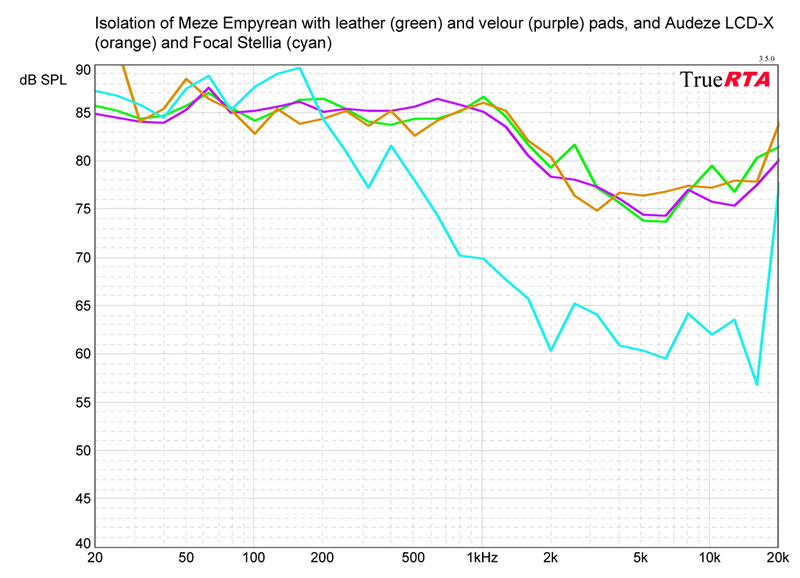 This chart shows how the Nexts’ tonal balance changes when they’re used with a high-impedance (75 ohms) source, such as a cheap laptop or some cheap professional headphone amps. 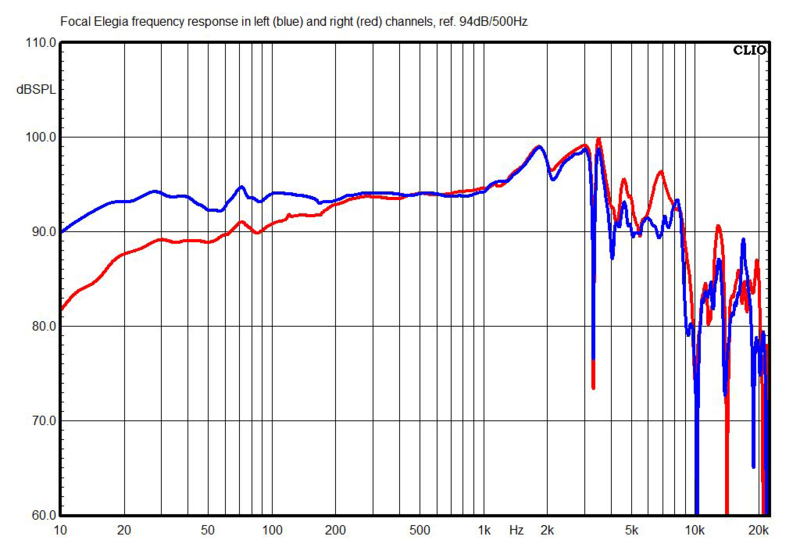 Using the higher-impedance source produces a very slight increase in the bass of about 1dB at 50Hz. 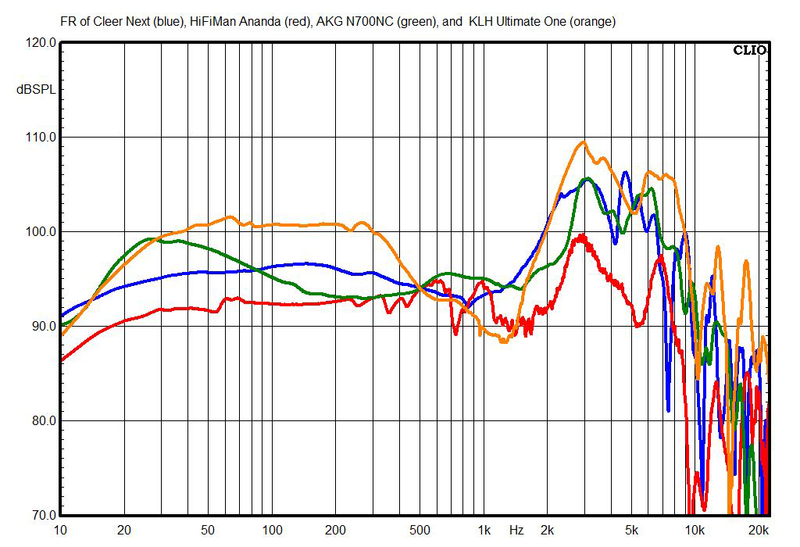 This chart shows the Nexts’ right-channel response compared with a few other audiophile headphones in the same approximate price range as well as with the AKG N700NCs, the headphones that probably come closest to conforming to the so-called “Harman curve.” The Nexts are close in some ways to the AKG N700NCs, although with a weaker and much broader bump in the bass, and more energy between 5 and 6kHz. 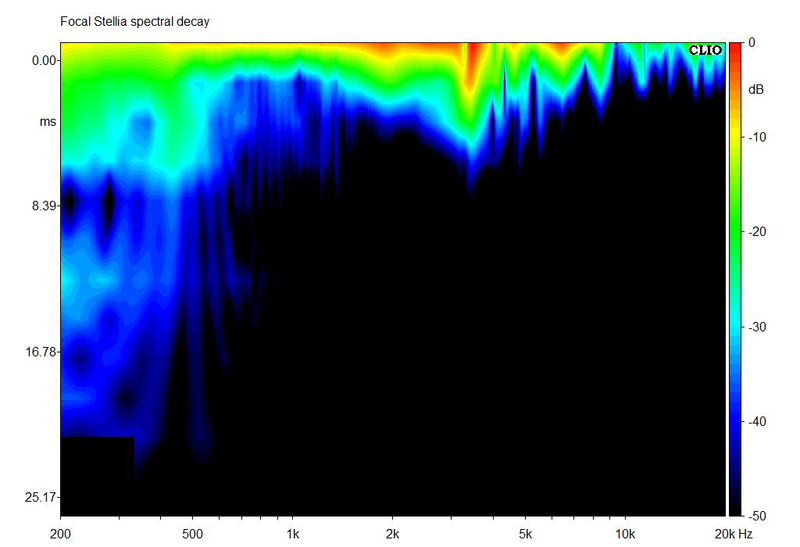 The Nexts’ spectral decay (waterfall) chart shows near-zero resonance across the entire audioband. 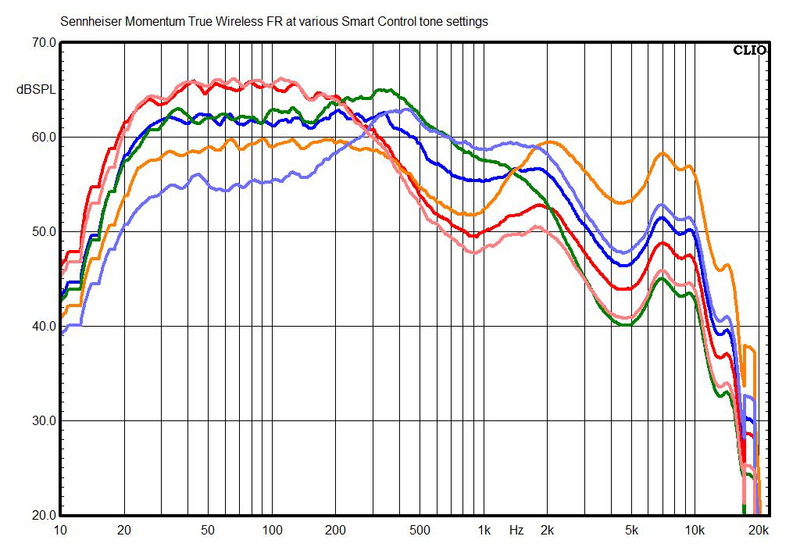 There’s just one very high-Q (i.e., narrow) resonance centered at 2.3kHz, which corresponds with a quarter-wavelength of about 1.5”, so it might be occurring within the earpads. The Nexts’ measured total harmonic distortion (THD) is unusual in that it’s basically flat at 3% in the bass at both of the test-signal levels I use for measuring. Normally it would rise at the higher level. Although it’s a little strange, I’d guess it isn’t a big deal, as 10% is the commonly accepted threshold for distortion audibility in subwoofers. In this chart, the external noise level is 85dB SPL, and numbers below that indicate the degree of attenuation of outside sounds. The isolation measurement of the Nexts suggests they’re really more of a semi-open-back design than a pure open-back design like the HiFiMan Anandas -- i.e., they do offer a modest amount of isolation at frequencies above about 1.5kHz. 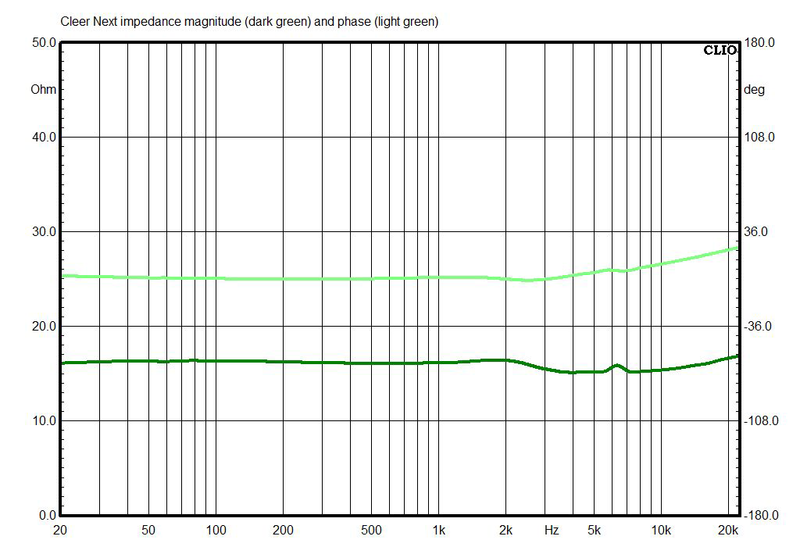 The impedance magnitude of the Nexts is just about dead flat at 16 ohms (same as the rating), and the impedance phase curve is similarly flat. I measured the Stellias using laboratory-grade equipment: a G.R.A.S. Model 43AG ear/cheek simulator/RA0402 ear simulator with KB5000/KB5001 simulated pinnae, and a Clio 10 FW audio analyzer. For isolation measurements, I used a laptop computer running TrueRTA software with an M-Audio MobilePre USB audio interface. The headphones were amplified using a Musical Fidelity V-CAN or an Audio-gd NFB-1AMP. These are “flat” measurements; no diffuse-field or free-field compensation curve was employed. 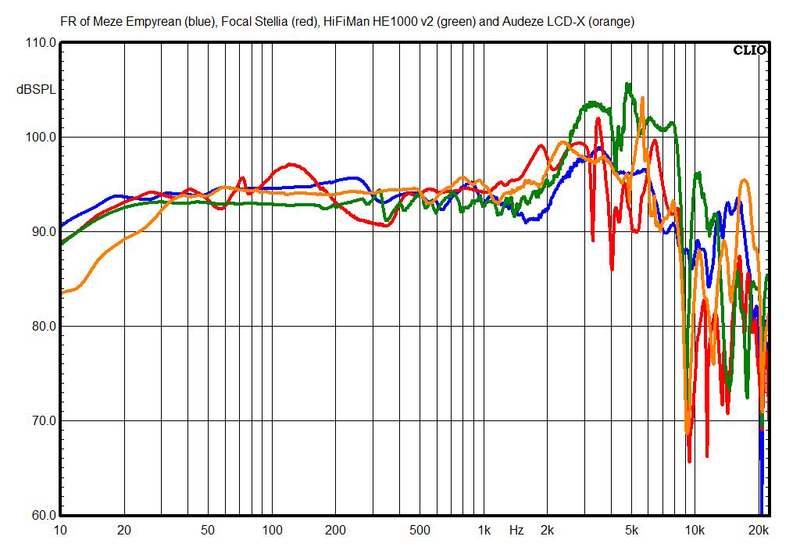 The above chart shows the Stellias’ frequency response. This is a little flatter than I typically measure from audiophile headphones. 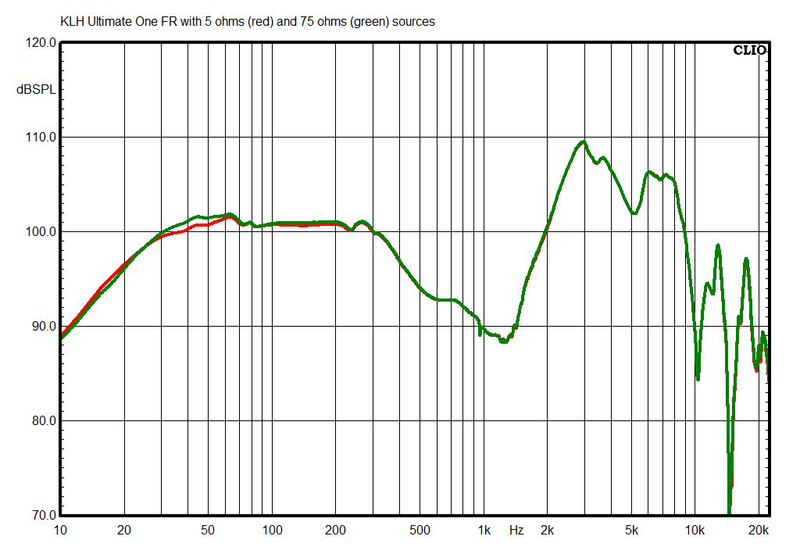 There’s a very mild resonant bass bump centered at 100Hz, and less of a pronounced peak between 2 and 4kHz than most audiophile headphones exhibit. 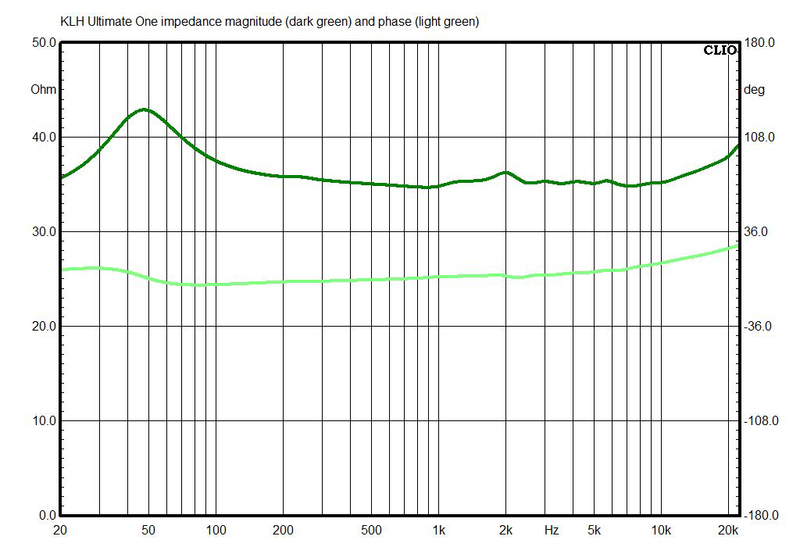 This chart shows how the Stellias’ tonal balance changes when they’re used with a high-impedance (75 ohms) source, such as an inexpensive laptop or some cheap professional headphone amp -- or more likely in the Stellias’ case, a tube amp with transformer output (although that still wouldn’t be near 75 ohms). Using the higher-impedance source produces an increase in bass of 2 to 2.5dB below 400Hz. 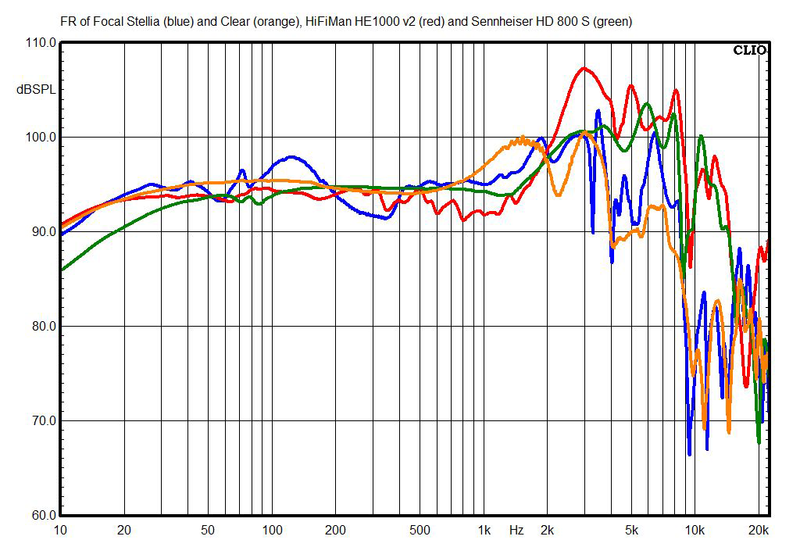 This chart shows the Stellias’ right-channel response compared with the Focal Clear, HiFiMan HE1000 V2, and Sennheiser HD 800 S headphones. You can see a bit of family resemblance between the Stellias and the Clears, although they have significant differences. 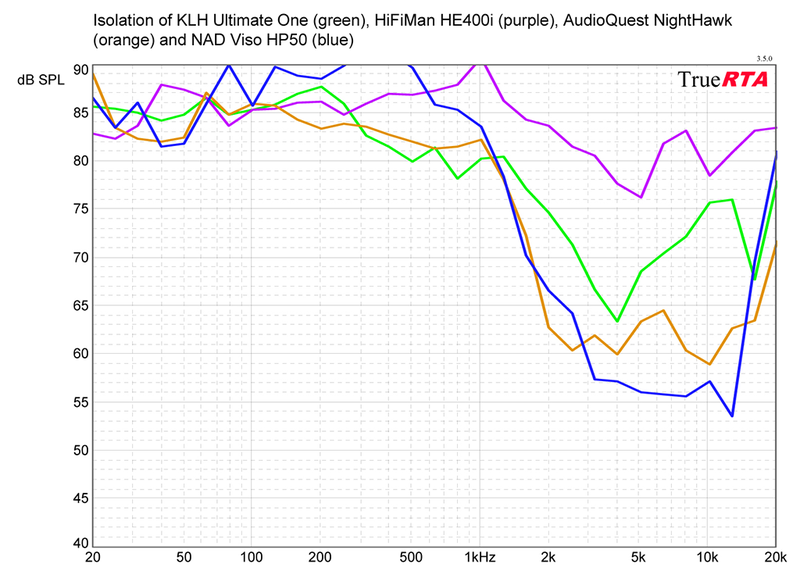 The HE1000 V2 and the HD 800 S headphones have a lot more treble energy and less bass energy than the Stellias. 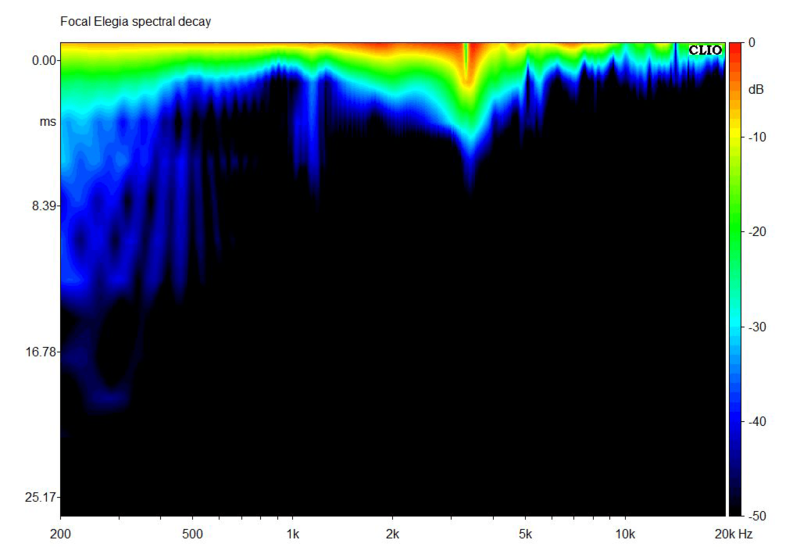 Across almost the entire audioband, the Stellias’ spectral decay (waterfall) chart shows a little more resonance than I’m used to seeing, but it’s almost entirely damped out within 6ms (one full cycle at 167Hz), so it’s very unlikely to be audible. In this chart, the external noise level is 85dB SPL, and numbers below that indicate the degree of attenuation of outside sounds. 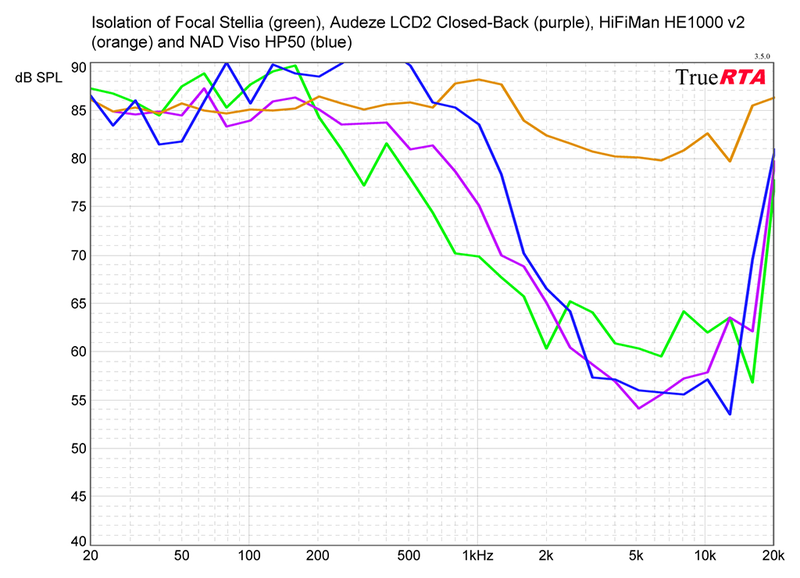 Isolation of the Stellias is in the same ballpark as other closed-back models such as the Audeze LCD2 Closed-Backs and the NAD Viso HP50s -- plenty enough to shield you against jibber-jabber and light background music in the unlikely event you bring your Stellias to Starbucks. The impedance magnitude of the Stellias averages about 40 ohms, and runs as high as 56 and as low as 31 ohms. That swing in the bass is what produces the difference in response when switching from a low-impedance source to a high-impedance source. 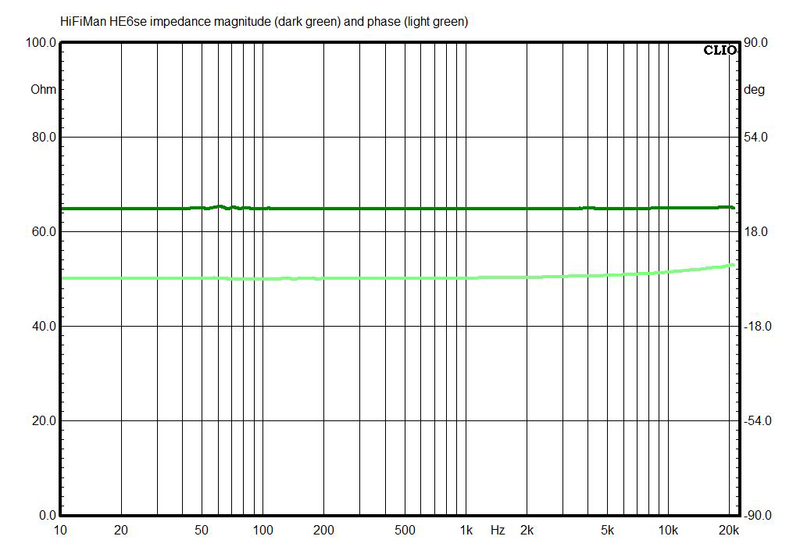 Despite the fairly large magnitude swing, the impedance phase is reasonably flat. Sensitivity of the Stellias, measured between 300Hz and 3kHz, using a 1mW signal calculated for 35 ohms rated impedance, is 104.0dB. For a large set of audiophile headphones, that’s really impressive -- feel free to plug them straight into your smartphone if you like. I measured the Ultimate Ones using a G.R.A.S. Model 43AG ear/cheek simulator/RA0402 ear simulator with KB5000/KB5001 simulated pinnae, a Clio 10 FW audio analyzer, a laptop computer running TrueRTA software with an M-Audio MobilePre USB audio interface, and a Musical Fidelity V-CAN amp, with an Audio-gd NFB-1AMP used for distortion measurements. These are “flat” measurements; no diffuse-field or free-field compensation curve was employed. 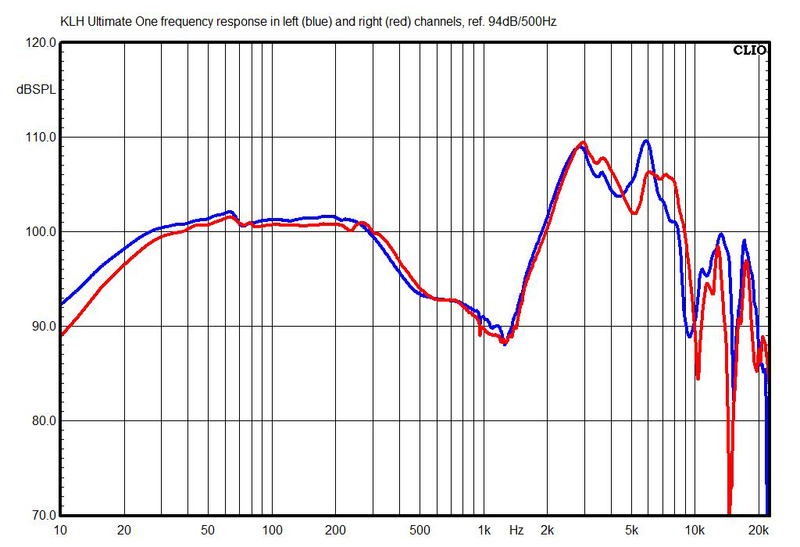 The above chart shows the Ultimate Ones’ frequency response. This looks typical except for the pronounced dip between 300Hz and 2kHz. Note the roughly three-octave-wide bump in the bass response. Because the bump is so wide, it will tend to make the bass sound moderately elevated in level rather than boomy. This chart shows how the Ultimate Ones’ tonal balance changes when they’re used with a high-impedance (75 ohms) source, such as a cheap laptop or some cheap professional headphone amps. 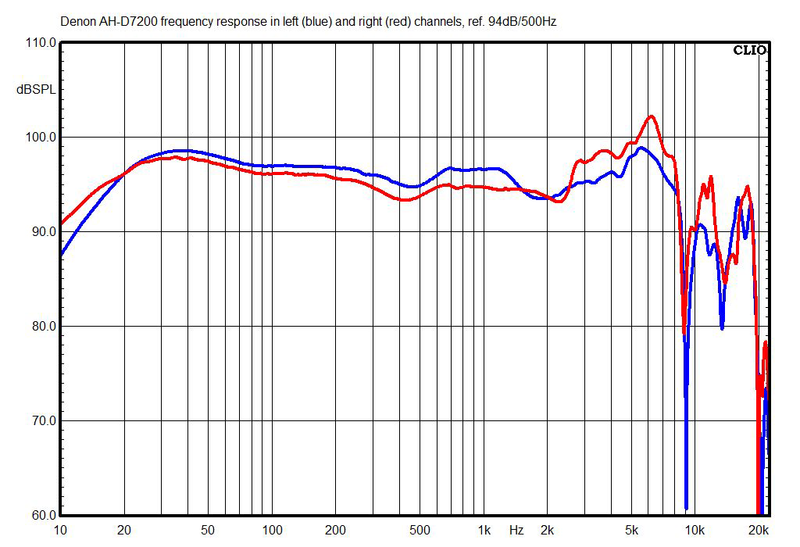 There’s barely any difference, just a roughly 1dB bass boost between 30 and 60Hz with the high-impedance source. 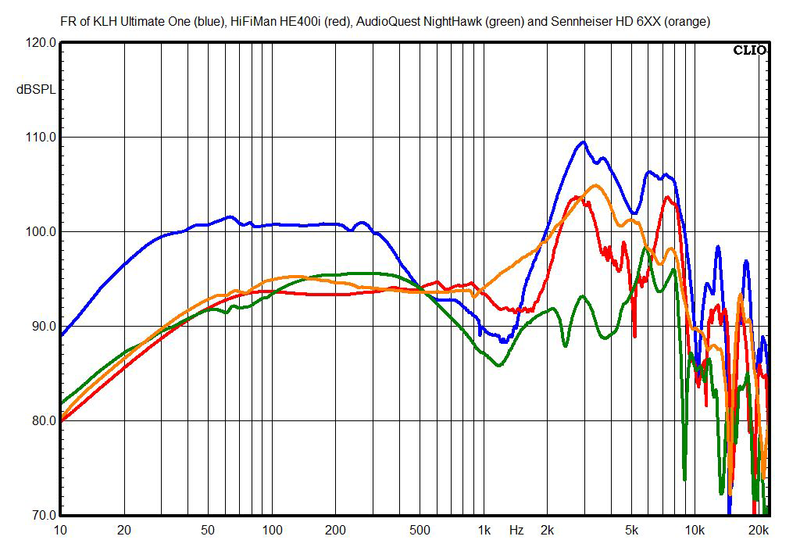 This chart shows the Ultimate Ones’ right-channel response compared with a few other headphones in the same price range (AudioQuest NightHawk, HiFiMan HE400i, and Sennheiser Massdrop HD 6XX). 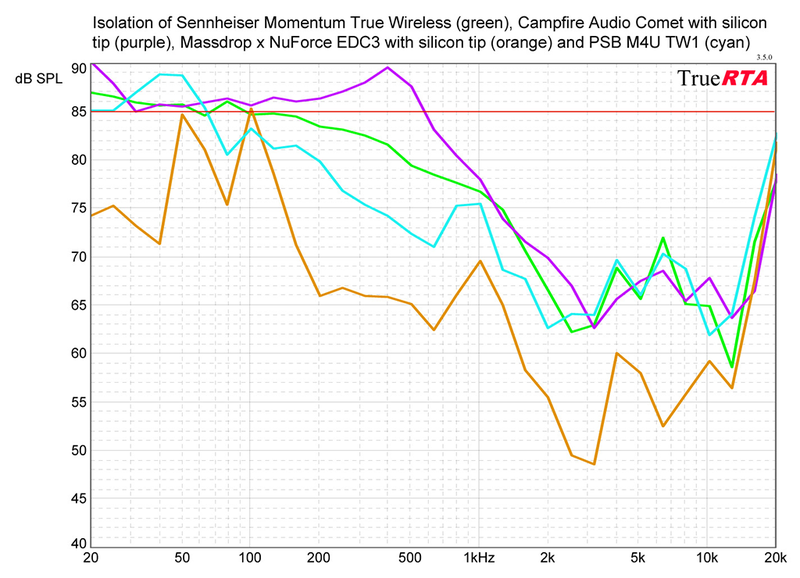 Note that these are all referenced to 94dB at 500Hz. Obviously, the Ultimate Ones’ deep midrange dip will make them sound quite a bit different than the other models shown here. 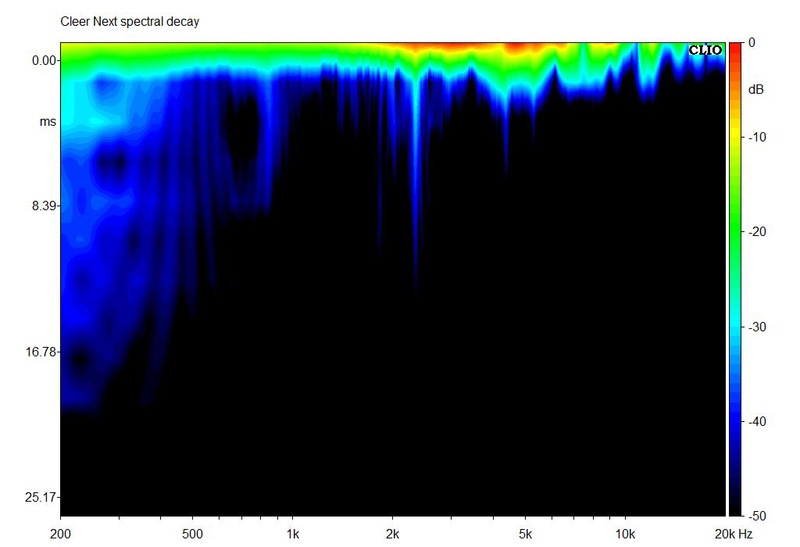 The spectral decay (waterfall) chart shows a little more resonance in the bass than I’m used to seeing, but it’s at -20dB right from the start and falls below -40dB after 8ms, or about one-and-a-half cycles at 200Hz, so I would be very surprised if it’s audible. 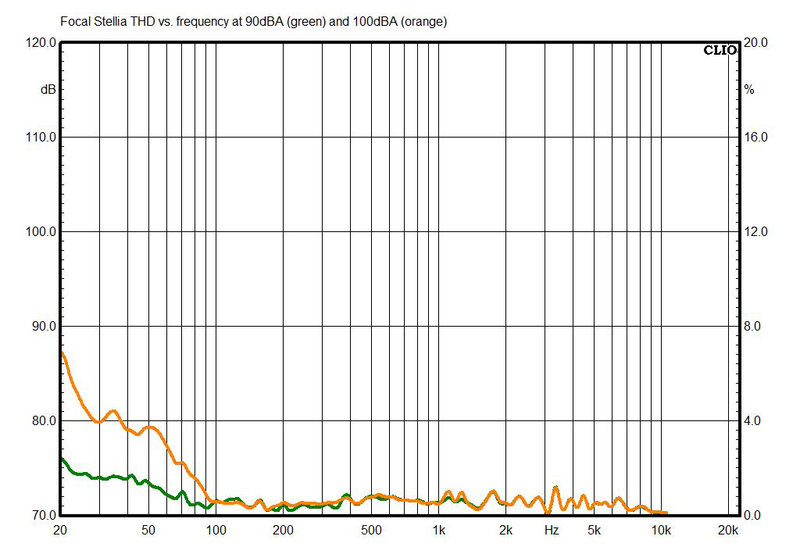 At the loud listening level of 90dBA (measured with pink noise), the Ultimate Ones’ measured total harmonic distortion (THD) is a little high below 100Hz. The bass distortion doesn’t rise much at the extremely loud level of 100dB, but there’s a little more distortion between 1.3 and 2.2kHz. In this chart, the external noise level is 85dB SPL, and numbers below that indicate the degree of attenuation of outside sounds. I’d classify the Ultimate Ones as semi-open-back, as they offer more isolation than fully open headphones such as the HiFiMan HE400i’s, but less isolation than a typical closed-back model such as the NAD Viso HP50. The impedance magnitude of the Ultimate Ones averages about 37 ohms and doesn’t vary much from that, and the impedance phase is also flat. Sensitivity of the Ultimate Ones, measured between 300Hz and 3kHz, using a 1mW signal calculated for 35 ohms rated impedance, is 97.0dB. So they’ll probably play loud enough from most smartphones, although you might not be able to get them really cranking. 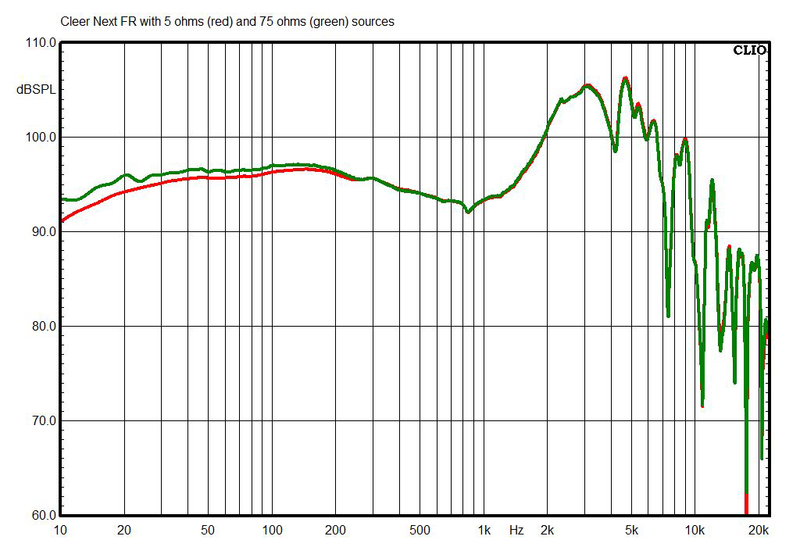 I measured the HE6se headphones using a G.R.A.S. Model 43AG ear/cheek simulator/RA0402 ear simulator with KB5000/KB5001 simulated pinnae, a Clio 10 FW audio analyzer, a laptop computer running TrueRTA software with an M-Audio MobilePre USB audio interface, and a Musical Fidelity V-CAN amp, with an Audio-gd NFB-1AMP used for distortion measurements. These are “flat” measurements; no diffuse-field or free-field compensation curve was employed. 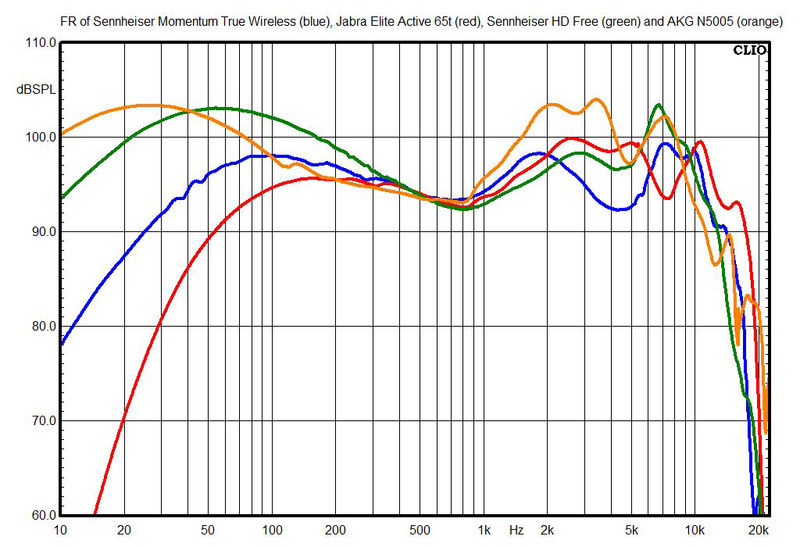 The above chart shows the HE6ses’ frequency response. 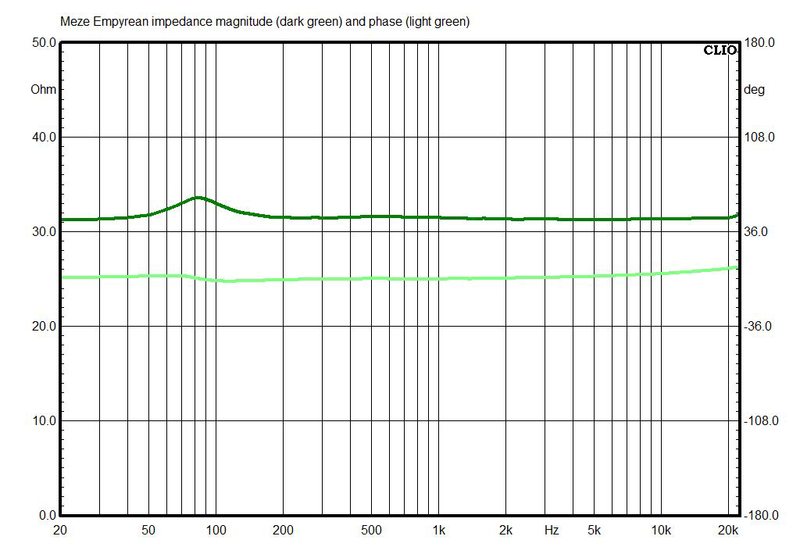 This is comparable to what I’ve seen with many HiFiMan models, and not far outside what I’ve seen from most open-back planar magnetics, except that the peak between 3 and 4kHz (which is generally considered necessary to create the illusion of hearing real speakers in a real room) is a few dB higher than normal. 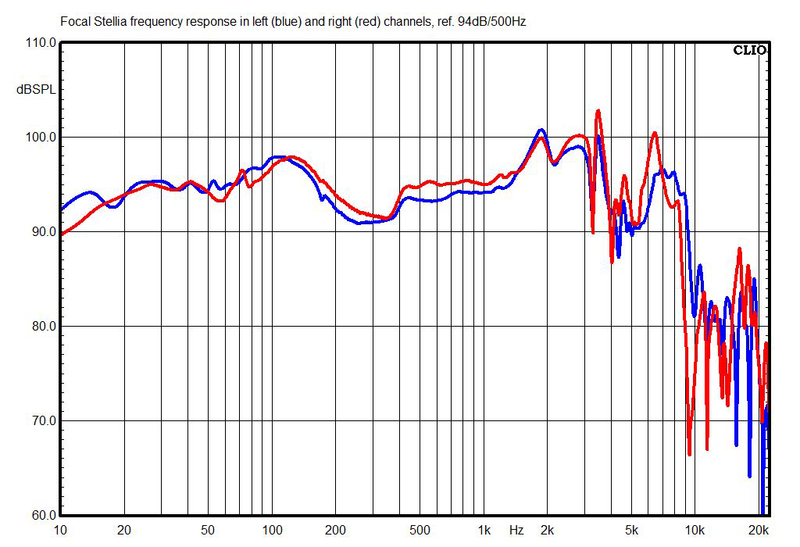 This chart shows how the HE6ses’ tonal balance changes when they’re used with a high-impedance source, such as a cheap laptop or some cheap professional headphone amps. (Of course, the headphones’ low sensitivity means it’s practically impossible to use them with a low-quality amp.) There’s essentially no difference at all, which means the HE6ses’ tonal balance probably won’t change if you decide to use them with, say, a high-output-impedance tube amp. 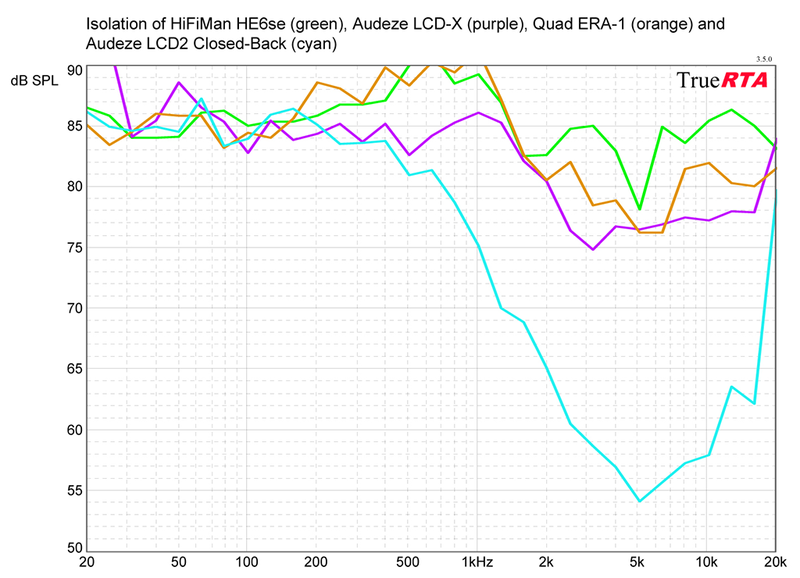 This chart shows the HE6ses’ right-channel response compared with three other open-back planar-magnetic models (the Audeze LCD-Xes, Focal Clears, and Quad ERA-1s with the leather pads). 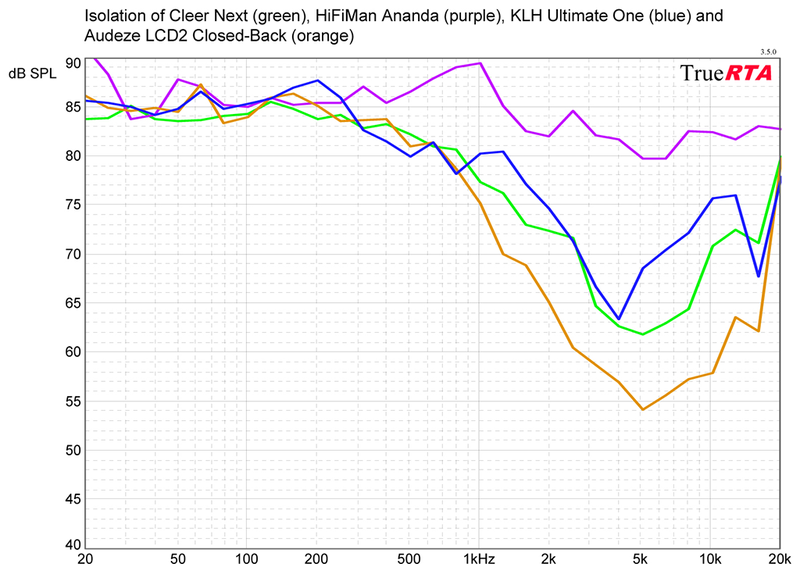 The strength of that peak between 3 and 4kHz is evident here; no way these headphones won’t sound a little bright. 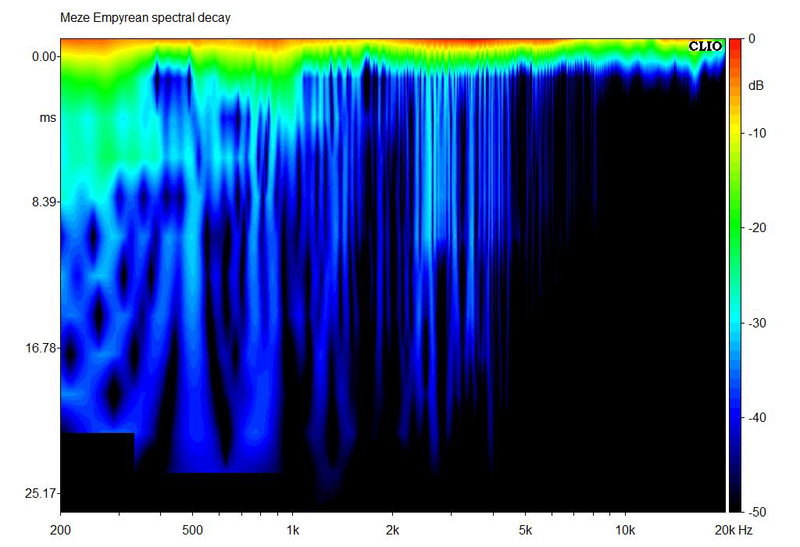 The midrange hash -- the very narrow, high-Q resonances between 3 and 5kHz -- of the HE6ses are seen in almost all the spectral decay (waterfall) measurements I’ve done of planar-magnetic headphones, but here they’re focused across a smaller band and are higher in magnitude. 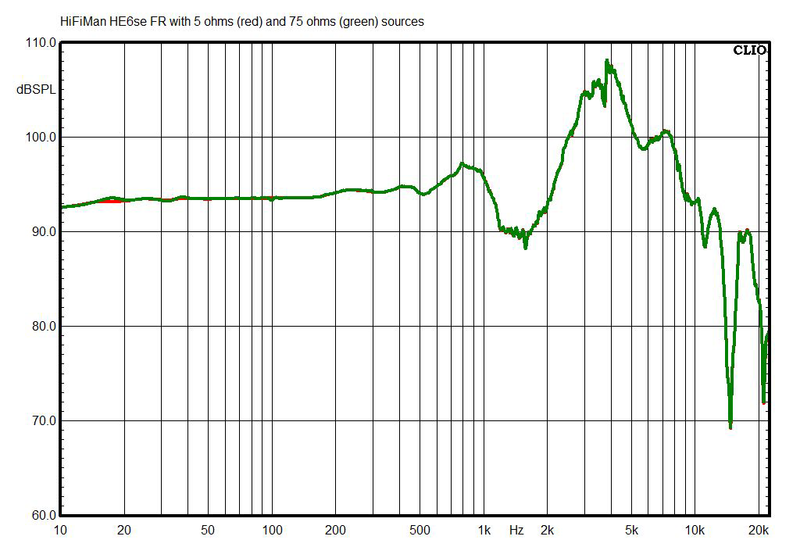 This corresponds with the big peak in the frequency response in this same range. 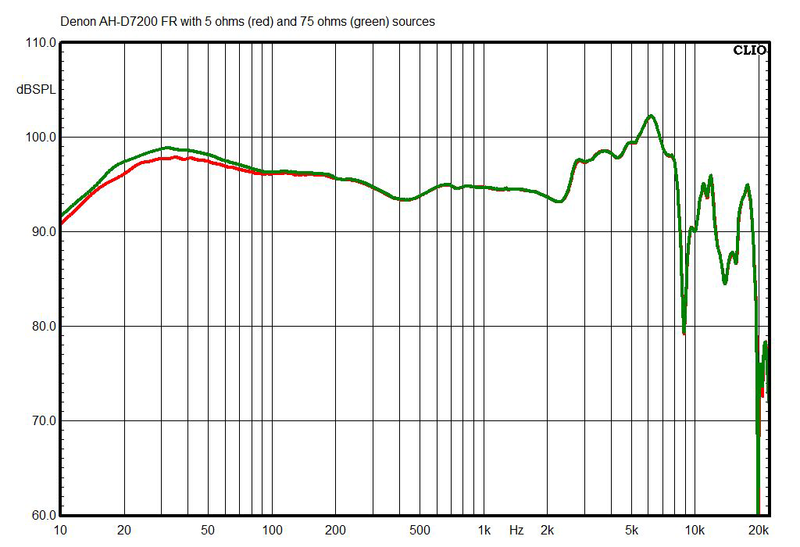 Meanwhile, the bass resonance is practically non-existent, the least I can remember measuring in any headphones. 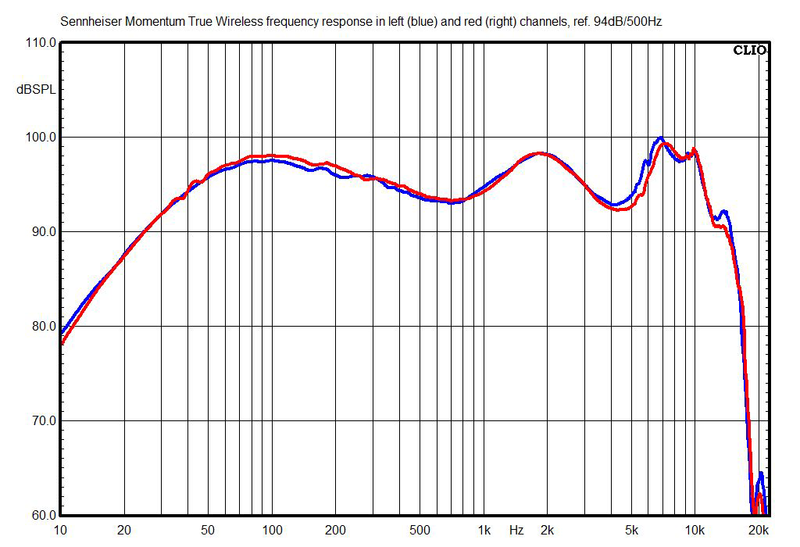 The HE6ses’ measured total harmonic distortion (THD) is pretty low, except for a weird little bump to about 3.5% centered near 1.5kHz. This is at the extremely loud listening level of 100dBA, though. In this chart, the external noise level is 85dB SPL, and numbers below that indicate the degree of attenuation of outside sounds. 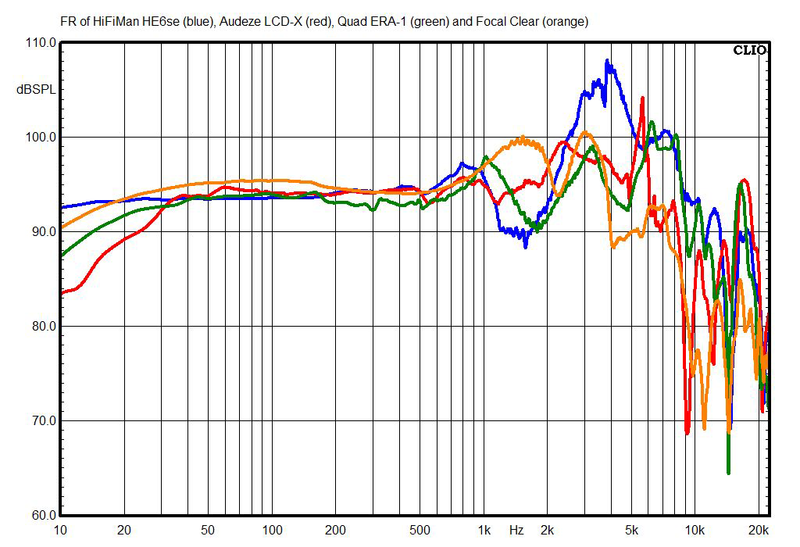 The HE6se headphones offer among the least isolation from outside sounds that I’ve ever measured -- but of course, open-back models aren’t supposed to isolate you from outside sounds, and the fact that the HE6ses provide so little isolation also means that the acoustical impedance of their rear grilles is very low, which may have contributed to the big sense of space I heard from these. 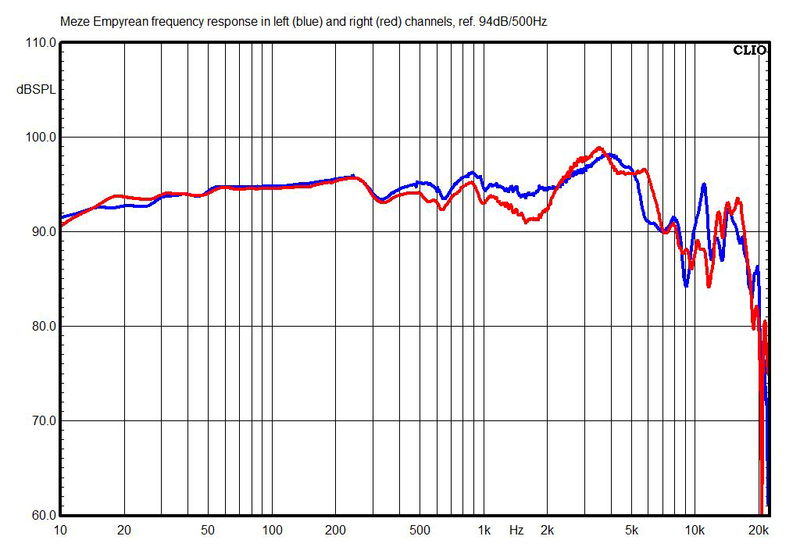 As usual with planar-magnetic headphones, the impedance magnitude of the HE6ses is almost perfectly flat. 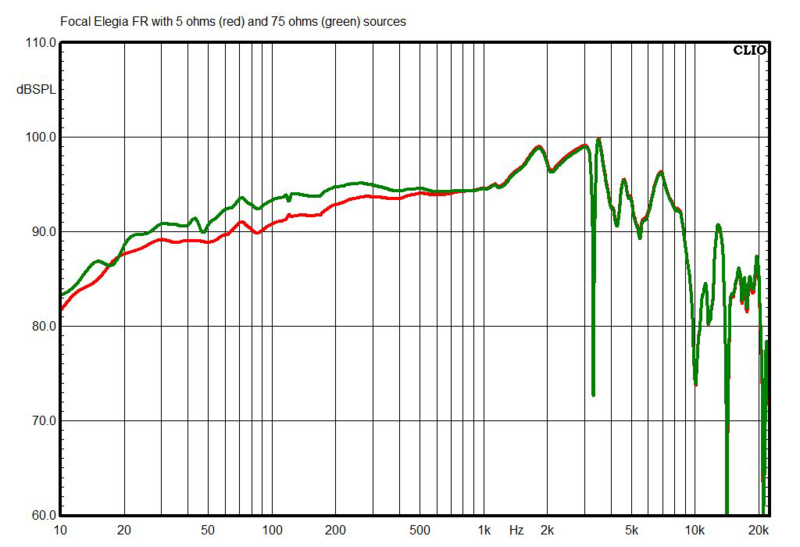 It’s about 65 ohms through the entire audio range, and the impedance phase is also flat. 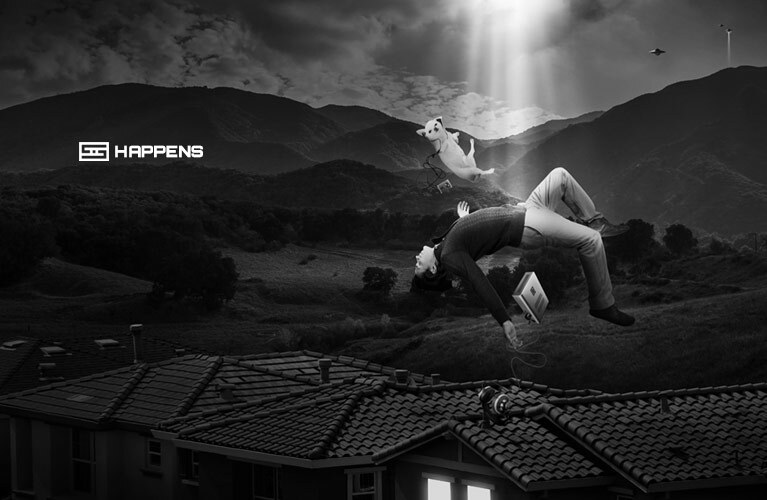 Brace yourself, because the sensitivity of the HE6ses, measured between 300Hz and 3kHz, using a 1mW signal calculated for 50 ohms rated impedance, is 79.2dB, more than 4dB lower than the already-low rating of 83.5dB. 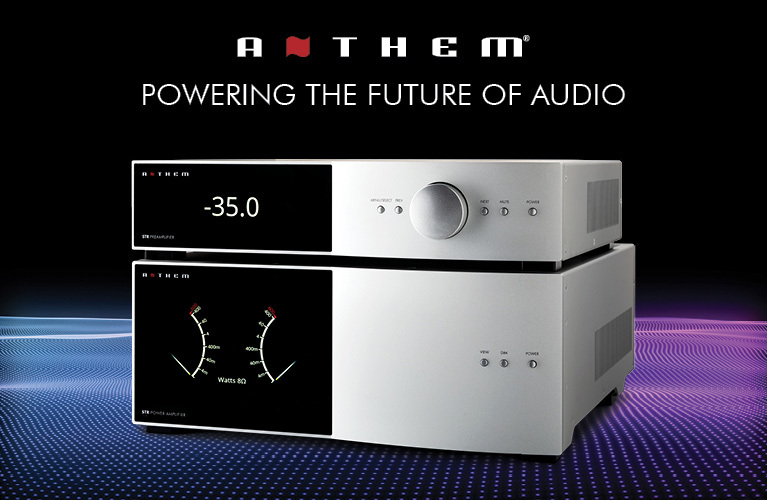 Which means you will definitely need an exceptionally powerful amp for these.